Wrought iron railing removal. It’s not exactly the most exciting thing on your to-do list. But hey, it’s there and waiting. Once beautiful, that wrought iron railing looks more and more rotten all the time. The paint is peeling off, there’s all sorts of rust, and it’s just plain ugly. Of course, it just might well be salvageable but, that does take a tremendous amount of work. Although, with a bit of time and effort, it’s possible. To save the wrought iron railing, you’ll first need to sand it down to the bare metal. This will allow you to determine how worn and damaged it actually is and whether or not to proceed. If it’s in relatively good condition, you can simply sand it and then repaint it with a couple or few coats. However, if it’s too far gone, you’ll need to dispose of it. Of course, that means having to junk it. Which ultimately means, needing a way to get rid of it. The best way to do so is to have a local junk hauler come by and take it all away. This also presents an opportunity to offload a bunch of other unwanted stuff, all at one time. Clear the immediate area. You’re first priority is to create working space. If possible, put down drop cloths to catch wayward screws, bolts, nuts, and the like. This way, you won’t have to hunt them down so they aren’t a hazard. Find and remove the fasteners. Next, you’ll need to determine how it’s put together. 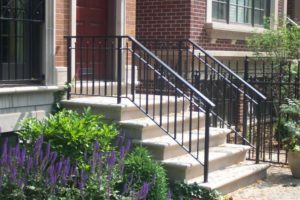 Most of the time, wrought iron railings are fastened with screws, or bolts and nuts. Now, these might prove difficult to loosen, so be prepared for that possibility. If you need junk removal of any kind, simply phone 800-433-1094 or visit Junk Garbage Removal.